TRY is a network of vegetation scientists headed by Future Earth and the Max Planck Institute for Biogeochemistry, providing a global database of curated plant traits. The TRY database is a research platform of iDiv. Plant traits - morphological, anatomical, biochemical, physiological or phenological features of individuals or their component organs or tissues - are a key to understanding and predicting the adaptation of ecosystems in the face of biodiversity loss and global change. In 2007 the TRY project was initiated to improve the empirical data basis for such projections, aimed at bringing together the different plant trait databases worldwide. In this context TRY is not an acronym, rather a statement of sentiment. Since 2007 the TRY Database is constantly growing and has accomplished an unprecedented coverage. 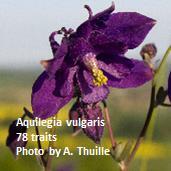 TRY version 5 (released in March 2019) contains almost 11 million trait records for 2100 traits of 4 million individual plants, representing 160,000 plant taxa (mostly species). About halve of the data are geo-referenced, providing a global coverage of more than 15,000 measurement sites. Data sharing in the context of the TRY initiative is organized by commonly agreed Intellectual Property Guidelines. Since 2007 the guidelines have evolved from a give-and-take system (TRY vs. 1 and 2) via optionally open access (TRY vs. 3 and 4) to open access (TRY vs. 5 and onwards). Starting with version 5.0 trait data are publicly available under a CC BY license (Creative Commons Attribution): the data are publicly available without restriction and the user is free to share and adapt the data, under the only conditions to give appropriate credit, provide a link to the license, and indicate if changes were made. For unpublished data TRY provides the opportunity of a 2(+2) years embargo period with restricted access. The TRY initiative has so far integrated more than 400 datasets, including original datasets of unpublished and published data, but also collective databases like LEDA, GlopNet, BiolFlor, SID, EcoFlora, FRED and many others, which have already combined several original datasets. In the context of the TRY Database the trait values are standardized, quality checked and made available upon request (for more detailed information see Database). 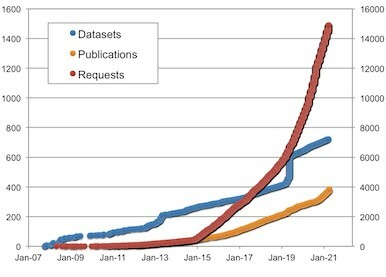 So far TRY has served more than 5000 requests and more than 210 scientific articles have been published using trait data via the TRY database. In parallel to the TRY Database the TRY website hosts the TRY File Archive, a repository for plant trait datasets complementary to the TRY Database. In the TRY File Archive datasets are stored and released as contributed. In this context we are able to provide DOIs for else unpublished datasets and thus make them discoverable, reusable and citable. Data requests from and contributions to the TRY Database and the TRY File Archive are organized via the TRY Data Portal. Objective 1: To provide a comprehensive web-archive of the functional biodiversity of plants at the global scale by assembling, harmonizing, and distributing published and unpublished data on functional plant traits complemented by a wide range of metadata - methodological and environmental information. Objective 2: To promote trait-based approaches aiming at understanding the emergence of plant biodiversity and its consequences for ecosystem function. To foster cooperation and accelerate scientific progress we have developed a data-sharing mechanism that ensures transparency and respects the ownership rights of data contributors. Objective 3: Analyzing the dynamics and predicting the fate of global ecosystems in the face of global change and biodiversity loss requires the application of dynamic global ecosystem models. Since its early days as fast-track initiative of IGBP the TRY initiative is committed to make comprehensive and high-quality data on functional plant traits available to modeling projects aiming at a more realistic representation of biological diversity. In this context, TRY is expected to serve as a benchmark for model calibration and validation of the next generation of global dynamic ecosystem models. The TRY initiative and database is hosted, developed and maintained at the Max Planck Institute for Biogeochemistry in collaboration with the German Centre for Integrative Biodiversity Research (iDiv) Halle-Jena-Leipzig. TRY is/has been supported by DIVERSITAS and Future Earth core project bioDISCOVERY, the IGBP, the Global Land Project, the UK Natural Environment Research Council (NERC) through its program QUEST (Quantifying and Understanding the Earth System) and the French programs 'Climat, Environnement, Societe' and 'Fondation pour la Recherche sur la Biodiversite'. TRY is working in close collaboration with the Latin American initiative DiverSus (CONICET-Universidad Nacional de Cordoba), the British Royal Botanical Garden Kew, the Macquarie University, the University of Minnesota and the Oak-Ridge National Laboratory.